Certainly well ahead of his time, Robert A. Heinlein remains one of the definitive writers of the science fiction genre, even today. 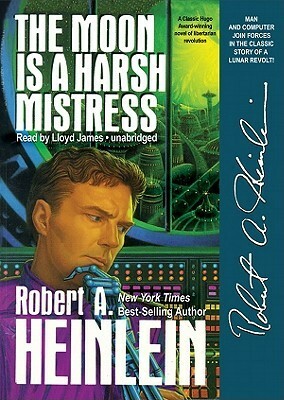 In The Moon is a Harsh Mistress, Heinlein covers such topics as artificial intelligence, extraterrestrial colonization, and interplanetary warfare. Even today, most of these subjects are accurately depicted in the narrative, even if some of the technology has advanced past where it was thought to be in 1965. Part of me is almost jealous at Heinlein’s ingenious use of Earth’s gravity well, and I know any attempt I might make to replicate the idea will merely seem derivative in comparison. As is the case with some of his other works, Heinlein makes many socio-political statements via his writing. His stance on taxes, revolutions, and independent governing bodies is a critical section of the plot in The Moon is a Harsh Mistress, and I can certainly see the theoretical benefits he puts forth in this context. That being said, his views on polygamy and polyamorous relationships are certainly on display again, with his previous work, Stranger in a Strange Land exploring these themes in greater detail. I can only assume the “free love” culture of the 1960’s shaped these opinions. Overall, the book wasn’t quite what I expected. The initial chapters made me hope the plot would center on the relationships between man and artificial intelligence (AI). If anything, AI is shown to be a powerful tool that can influence society in ways we can’t even begin to comprehend. At the very least, the main character was quite entertaining, if not hard to understand at times with his “accent.” If we do eventually colonize the moon, I can hope we do so peacefully and in a way that doesn’t lead to an uprising of its native inhabitants. After all, I do like living in a Colorado Springs devoid of meteoric bombardment. A well-thought out sci-fi story decades ahead of its time, I give The Moon is a Harsh Mistress 4.0 stars out of 5.